The bumps of everyday driving cause tires to go out of alignment, leading to faster tire wear and can reduce gas mileage. Our expert technicians have the right tools and knowledge to get you running smoothly again. Your alignment and suspension system helps you stay in control when you are on the road. Perrysburg Auto Mall offers quality affordable auto repair services and suspension repair in Northwest Ohio to ensure your safety by keeping your suspension system up to whatever the road may bring. We are proud to offer state of the art electronic road force wheel balancing and Alignments courtesy of the latest Hunter Machines. 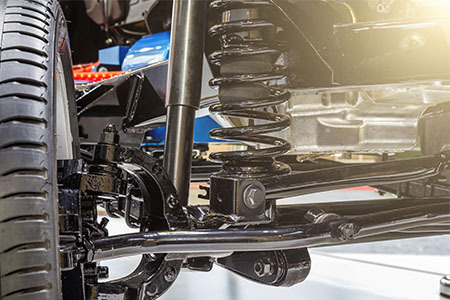 We have Automotive Service Excellence and Hunter trained Front Suspension Specialists to work on shocks, struts and all suspension concerns on all makes and models. Maintaining your vehicle’s undercarriage is important for a number of reasons. Specifically, keeping the suspension in check and the alignment centered are critically important. Shocks keep you from feeling every single little bump in the road, while also protecting your vehicle from vibrations and jarring. We replace damaged shocks where necessary. Struts provide vital support for your vehicle’s suspension. If your shocks are damaged, your struts likely are too. We can repair and replace struts to restore the integrity of your undercarriage. Ball joints have a tendency to wear out and break down over time. We can replace these components to keep your wheels stable and your steering intact. Steering column repairs cannot be ignored! If you are struggling to turn the wheel or losing tracking as you drive, we can help. Low power steering fluid levels can make it difficult to turn your wheel. We check fluid levels, top off your fluid and can check for leaks along the way. This system enables you to turn your steering wheel and have your car respond in kind. If it becomes disjointed, so will your steering. We can service rack and pinion issues to keep everything moving along. Alignment troubles often lead to tire service in Northwest Ohio. Let us help you avoid that cost with routine alignments when your vehicle starts veering off course.